I’ve never DNS’d (Did Not Start) a 5k, but I came close last weekend. When I registered for the Cherry Garcia Run, I was excited. My first race as an officially pregnant person! (I was pregnant when I ran the Shamrock Shuffle 10k, but didn’t know it). A cap to my birthday weekend! Plus, the Cherry Garcia always has pizza and ice cream at the end. Win. The week before the race, though, I got dubious. For the first time in several years, Albuquerque has been having its typical June weather, which means: HOT. And yes, this race is an evening event, which should help in theory, but…doesn’t. And don’t say “But it’s a dry heat” — you go for a 97-degree run at high altitude under a cloudless sky and tell me how much fun you have. In the end, I decided to do it. I was going to take it easy — racing for two, and in those conditions, means not even entertaining the thought of a PR, an overall win, or anything of the sort. I was going to drink lots of water, including at the mid-course aid station, which I usually ignore in a 5k. I wanted to focus on the gift of running, and heat or no heat, try to have fun. I drank plenty of water beforehand. I didn’t bother doing a warm-up jog. I hung out with my favorite support crew, a.k.a. Robin Hood and Ann, in the shade for as long as possible before meandering to the starting line. We started on a high school track, so I stood on the comparatively cooler grass of the infield until about two minutes before the horn sounded. Hey, every little bit helped. The Super Soaker Firing Squad. This was a line of kids, and a few token parents, strategically stationed so that the runners passed them at the very beginning and very end of the race. I didn’t pay much attention to them at the beginning, but when I approached them at the end and they asked “if I wanted water,” I said “YES!” Of course, when one of the moms proceeded to yell “Let her have it! !” I felt a brief flash of terror, but getting blasted by water guns has never felt so good. I swear, it carried me across the finish line. With a smile on my face, no less! After making a bee-line for the water and Gatorade coolers, I reunited with Robin Hood and Ann — poor pup, there were lots of other dogs around and she desperately wanted to make friends with all of them. From there, it didn’t take long to locate the post-race treats, and soon we were sitting at a picnic table, eating ice cream as the sun set. There’s nothing quite like the contented, sweaty vibe that you find after a summer evening race. Then they posted the race results. Out of curiosity/habit, I walked over to check them out. Since I hadn’t exactly “raced,” I didn’t expect much. 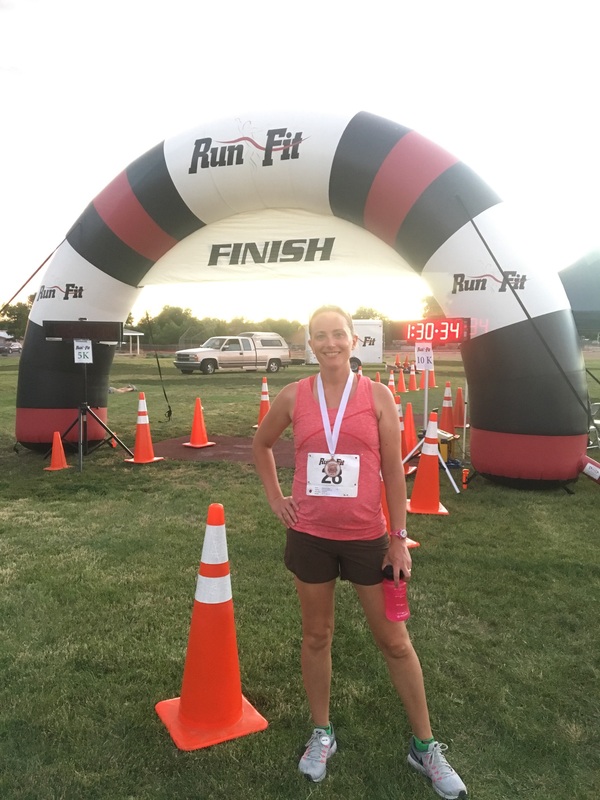 Turns out…my official time of 27:15 was good enough for 3rd in my age group! Gleefully, I ate more post-race food, accepted my medal, and paused in the sunset for a moment before heading home for a shower and much-needed sleep. How fun! Is this race named after the Ben & Jerrys ice cream? I agree, I love the vibe of short summer races in the evening. Great job! That is some crazy heat to run in, but the water gun and misters sound amazing!